The NHK Anime World news blog announced the main staff members for the Mairimashita! Iruma-kun anime series on Monday. The TV anime adaptation of Osamu Nishi's comedy fantasy manga will air on NHK-E in October 2019 and run for 23 episodes. 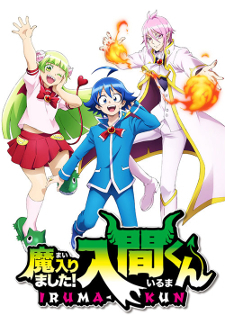 The manga began its serialization in Shounen Champion in March 2017. Akita Shoten published the ninth volume on February 8. The tenth volume is scheduled to go on sale on April 8. I am disappointed with the key visual. For a studio such as Bandai Namco I expected something more refined. But looking through their catalogue this does fall in line with the visuals. I will need a PV before judging but it does look like some dumb fun. Being on NHK makes me believe that it can have a sequel. 23 episodes is long enough so I hope to enjoy it. I mean, that part would be on the character design and the guy is a freelancer. Oh no, that visual key tho. is this going to be long run? this series still only has 9 volume. Am I the only person that thinks the character designs looks alright or fine? Like they don't look special, but they can work if executed right with the faces and all. I think the designs look good. They probably don't read the manga, it's faithful to its style. The designs are more or less the same as the manga, so i dont really see the problem. The color actually improves it a little in my opinion. Anyway glad it is getting 2 cour and since it is an nhk show if it is well received more could be done in the future. The artwork is really cute, look's promising! I'm actually surprised this got a 2 cour. Ahh alrighty. I was just wondering and I'm also puzzled because uh-- let's just say I don't see an issue with the designs on their own. On paper it might even work with the expressions, but it's highly up to the people that are in charged of the series. When I said they don't read the manga I was talking about the people above our discussion. I wasn't really clear enough when I said it. Ah okay. Though I understood where you're coming from lol.